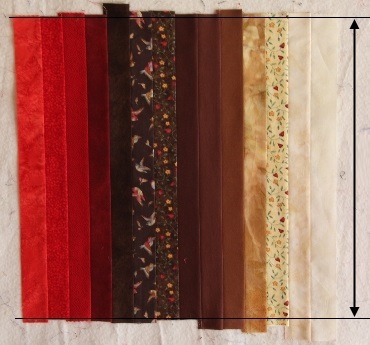 This page gives hints on how to create strip sets from the fabric strips you have created. Use a fine cotton or mercerised cotton thread of a blending colour, start with a new needle and use a 2.5 stitch length. Seams need to be sewn accurately. Use a ¼” foot with a guide. To check your sewing, cut three small strips of scrap material, each 1½” wide. Sew together. The middle section should be exactly one inch wide. Press each seam before sewing that piece to the next one, ensuring that the seams are straight. Sew together all the strips in pairs, making sure that selvedges are all at the same end. Place the top-most fabric on top of the other one and align the non-selvedge ends (as closely as possible). Sew from that end towards the selvedges (which may or may not be aligned). Press. Sew together adjacent pairs of strips; align the non-selvedge ends, but sew from the selvedge end, that is sew in the opposite direction to the first set of strips. Press before doing more sewing! Repeat step 3 until all the strips have been sewn together.